I’m writing this letter as I prepare to celebrate International Women’s Day on 8 March, since I thought it would be a good occasion to highlight something that has struck me about the opera world in recent years. I love opera and I’m a great fan of Opera Now – I’ve been reading the magazine regularly since 2001; but I can’t help remarking on a run of recent covers: Albina Shagimuratova, Elīna Garanča, Kristine Opolais and Marianne Crebassa are all attractive young women, photographed to emphasise their youthful, diva looks together with some aspect of a kittenish sexual allure. The most recent issue of the magazine (March 2017), on the other hand, had Thomas Hampson on the cover. He is a formidable artist, of course, as well as being a man of a certain age and experience, greying at the temples. He is photographed to highlight his downto- earth, approachable personality and his status as a ‘serious’ commentator on opera. 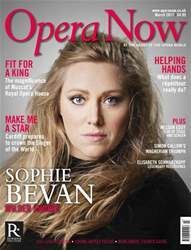 British soprano Sophie Bevan discusses her starring role in a new opera at ENO; exploring the hidden art of the répétiteur; traditional craftsmanship meets contemporary design at Oman’s Royal Opera House Muscat; and Cardiff prepares to crown the Singer of the World. Plus, our pick of this year’s top singing competitions around the world; English Touring Opera proves that learning about opera can be educational and fun; American baritone and movie star Nelson Eddy; Simon Callow’s Wagnerian triumph; and Elisabeth Schwarzkopf’s legendary recordings.